Though we don't think about them very much, teeth are an important part of our lives. We use them every day, put them under our pillows for the tooth fairy when they fall out, and smile with them. We even have special doctors called dentists to make sure they stay healthy. So why are our pearly whites so important? For all animals that have them, including humans, teeth are the first step in digesting food. Teeth are made up of three different layers. An outer layer of enamel covers the inner, bone-like dentin. Both of these layers surround the pulp, which has all of the nerves and blood vessels. Animals have evolved many different kinds of teeth depending on their needs. Carnivores, or animals that eat only meat, have sharp incisors and canines they use to grab and rip apart their food. Herbivores eat plants instead of other animals, and they have evolved two types of teeth to better eat plant matter. The front teeth, or incisors, are made for clipping or stripping grasses, leaves, and other vegetation, while flat, broad molars at the back of the mouth chew and grind. Omnivores, or animals that eat both plants and other animals, have teeth designed to not only grip and rip meat but to grind plant matter. Elephant tusks are actually teeth! They just don't use them for eating food. African elephants use their tusks to protect themselves and lift objects. The tusks of Asian elephants are called tushes, and seldom grow more than a few inches beyond the lip line. Like with all rodents, a rabbit's teeth never stop growing. Constant wear keeps their front incisors from growing too long. Snails have the most teeth at one time than any other animal in the world. A snail can have as many as 15,000 micro-teeth. A specific type of sea snail called a limpet has teeth made of the strongest material in the world. Goats are born with eight teeth. Birds may not have teeth now, but they did millions of years ago. Scientists have discovered a gene in chickens that makes chicken embryos grow alligator-like teeth when it's activated. Herbivores don't just eat leaves and grasses. There are specialized herbivores that only eat nuts and seeds as well as those that only drink nectar. Diet doesn't just affect how your teeth look. What an animal eats also determines the shape of its skull. All cats, from lions to house cats, have molars that are small and sharp. Sharks have multiple rows of teeth and constantly shed them. A single shark can go through as many as 50,000 teeth in its lifetime! Not all poisonous snakes have hollow fangs. About 86% of poisonous snakes have grooves in their fangs instead. The poison drips from special glands in their gums and slides down the grooves into the fresh wound caused by the fangs. An adult long-snouted spinner dolphin can have as many as 200 teeth at any time. There are 67 different species of toothed whale and 11 species of baleen, or "toothless," whales. Instead of teeth, baleen whales have a mouth full of stiff plates made of keratin that they use to filter food from the water. With 80 to 100 teeth, the giant armadillo has the most teeth of any land-based mammal. The Borneo cloud leopard has the longest canines of any cat, measuring up to two inches long. Orangutans and humans have the same number of teeth. Domestic dogs, unlike their wild cousins, are omnivores that have developed molars with grinding surfaces. Giant pandas eat meat sometimes, but their diet is almost 99% bamboo. They have evolved the largest molars of any animals that eats meat to help chew their food. Some human babies are born with teeth! Though they have large canines, raccoons are actually omnivores, with molars well-adapted to grinding plants. George Washington was famous for his false teeth that were supposedly made out of wood. In reality, he wore dentures made of many materials, including ivory, gold, and human teeth. Some monkeys have been observed using hair to floss their teeth. Rats have teeth strong enough to chew through materials like concrete and aluminum. There are four kinds of teeth: incisors, pre-molars, molars, and canines. Omnivores have a well-balanced mix of all four kinds to better chew our varied diet. Check out this fun, interactive game that helps you discover the differences between carnivores, omnivores, and herbivores. Teeth are a lot more complicated than you think. 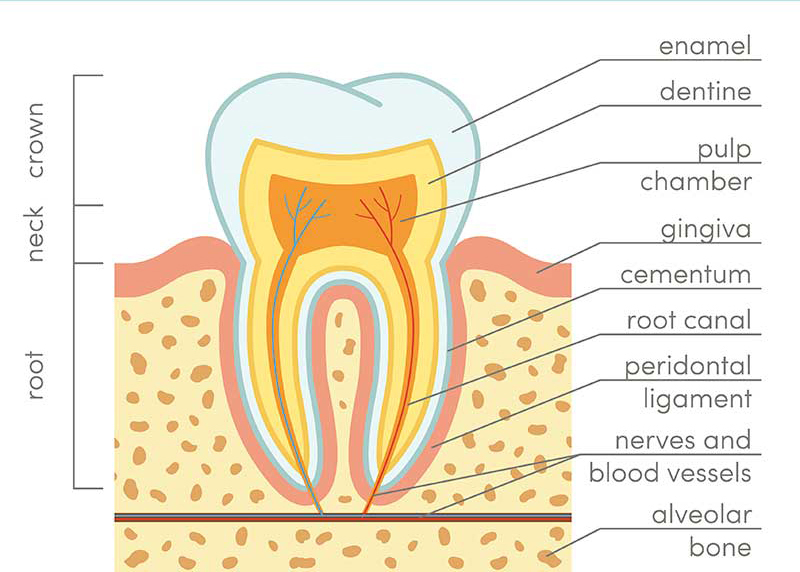 Your teeth are made up of three different layers, and each one has an important function. Discover more about animal teeth with this guide and worksheet designed for younger children. Taking care of your teeth is very important. Not brushing properly can lead to tooth decay, which means extra trips to the dentist or even having to have some pulled! Did you know that dinosaur teeth are more complex than those of either reptiles or mammals? Scientists have discovered that some dinosaurs had teeth with many more layers of tissue than those in modern animals. Want to know more about your own teeth? Learn the types of human teeth and important tips on brushing and eating properly, and quiz yourself on the details! Take a look at the teeth of animals to see how their teeth affect their diet. Knowing what a dinosaur's teeth look like is a great way to tell whether it ate meat or munched on leaves.